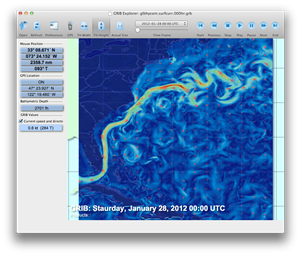 Finally a GRIB viewer with the power to display all the benefits of GRIB data to the Mac user. Professionally crafted…Powerfully accessible…Personally supported! OCENS has done it. 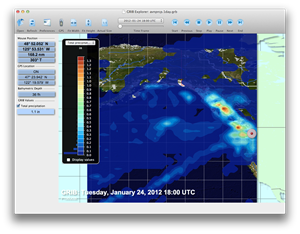 Harnessing its long experience with GRIB data and analysis into a viewer now setting the highest standard for GRIB viewing and analysis on the Mac OS. 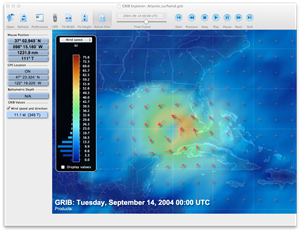 GRIB Explorer for Mac is a 100% Mac native application that is both elegant and intuitive while supporting an unparalleled number of GRIB data – more than any other viewer on the market. These data are displayed in gorgeous full color interactive maps dynamically displaying the weather data of interest to you. Simple-to-use tools built from OCENS’ years of experience with GRIB data then enable you to quickly pull reliable insights from GRIB content. 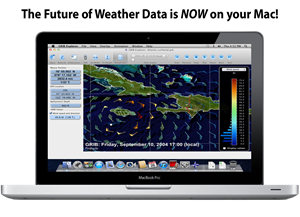 Need a good source for weather data - look to WeatherNet for Mac! Click here for details. Open and view GRIB data in full color. Fully customizable data displays can even be tailored to your personal preferences for specific product types. 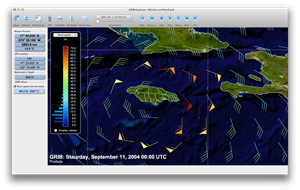 Animate GRIB weather forecasts to gain an intuitive feel for how weather and ocean conditions are likely to change in the coming hours and days. GPS linkage displays your present position. Point your cursor at specific GRIB weather or ocean features and see an immediate heads-up display of lat/lon of that feature and its bearing and range relative to your present location. Ocean bathymetric (bottom contours) are imbedded in background maps. Choose from Google Earth-like background maps or almost any set of ocean and earth color assignments. 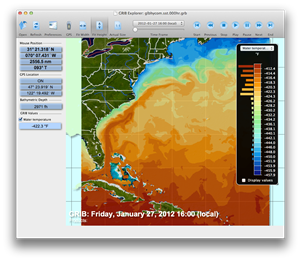 Pass your pointer over GRIB Explorer’s interactive Color Key and immediately view all the locations in the GRIB map matching specific ocean temperatures, wind or current speeds or other features of interest to you. Zoom tools provide startling clarity and almost infinite detail. Political and geographic features can be automatically attached to your GRIB map. Download the DMG file and save it to your desktop or other folder and then open it to install the software.